Turtle Candy is something that I indulge in once a year, only. And this is for a very good reason. If there is one thing I love and that is turtle candy. Lightly toasted whole pecans, topped with caramels that have been melted with a touch of heavy cream and melted chocolate to top it off! C’mon, what’s NOT to like! Add a light dusting of Himalayan Pink Sea Salt, and you have perfection in my book. This year we decided to top our turtle candies with a light dusting of sea salt. It seems that everything is topped with sea salt, so this year I jumped on the band wagon and gave it a try. For some reason, we had a Himalayan pink sea salt grinder in my cupboard, no doubt from the hubby, so I went with that. Everyone in the family loved the addition of salt, me on the other hand…. I have a confession to make, I’m not a huge salt lover. I really don’t salt anything and only add salt to recipes when needed. Never, ever do I salt my food or plate of food. When I eat pretzels for instance, I rub the salt off. Same with french fries. I can already here the moans and groans. My hubby, who is a salt freak, just shakes his head at me. He cringes every time he sees me rubbing my pretzel rods together too get the salt off. Auntie Anne’s Pretzels, no salt please. Most people when they go to the Doctor for a check-up are usually put on a salt-free diet or salt restrictive diet. Everyone is well aware of the health issues of having too much salt in their diets. What many people may not know, is having low sodium in our diet, isn’t good either. Our body needs salt. (I need to do more research on the Why?) I suffer from low sodium, therefore I need to add more salt to my diet. Go figure! Delicious homemade candy that is irresistible. 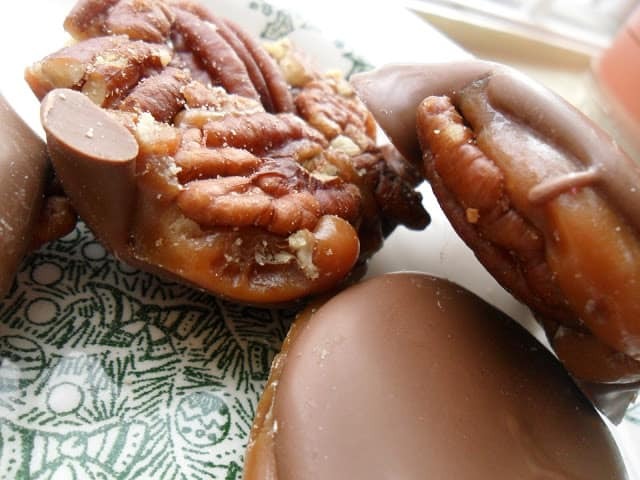 Spread pecan halves on a baking sheet lined with parchment paper. Bake at 350º until golden brown, stirring often (generally, nuts will be toasted in 6 to 10 minutes). Remove from oven, cool pan on wire rack. In top of a double boiler over hot water, melt caramels with heavy cream until smooth and creamy. 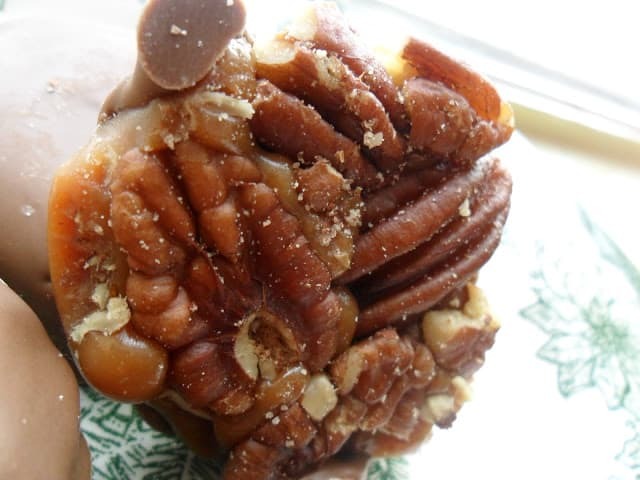 Arrange pecan halves in groups of 4 to 5 on waxed paper sprayed with non-stick cooking spray. Spoon caramel mixture into a small mound in the middle of the nuts. Lightly sprinkle sea salt on top of caramel (caramel should partially cover the nuts to keep the nuts in place) Let stand until caramel is set. In top of a double boiler over hot water, melt chocolate, stirring gently using a small spoon. Coat caramel with melted chocolate. Lightly sprinkle sea salt on top. Let stand until chocolate is firm or refrigerate 30 minutes. Looking for more Christmas Candy Recipes, we have several you’re going to want to try. Double Chocolates or Truffles, Peanut Butter Balls and Pretzel Bites. I want to make these but am curious as to what T means it says 2 T of heavy cream, is that 2 tablespoons or teaspoons?? Glad you asked:) T means Tablespoon and t means teaspoon~ Enjoy! Made these tonight…They are absolutely Delicious…I also drizzled vanilla almond bark over the top of them. Hi Lynn, This recipe looks really EASY and of course it has to be delicious. I think I need to get started on my Holiday sweets. Thanks for sharing on FFF Nutty party this week. I'm sharing this on my FB page tomorrow. 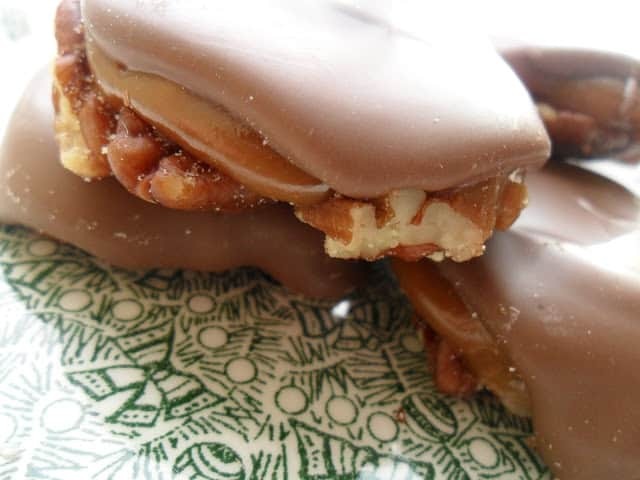 This is my all time favorite home made holiday candy…..I make fudge, peanut clusters, angel food candy and cereal clusters plus the turtles:) I have been making these 5 every year for 30 years! !